Today, at the Enterprise Connect event in Orlando, Florida, Microsoft Teams won the Best in Show award for the second year in a row in recognition for its vision for making communication and collaboration easier for the entire workforce, including those on the frontline. 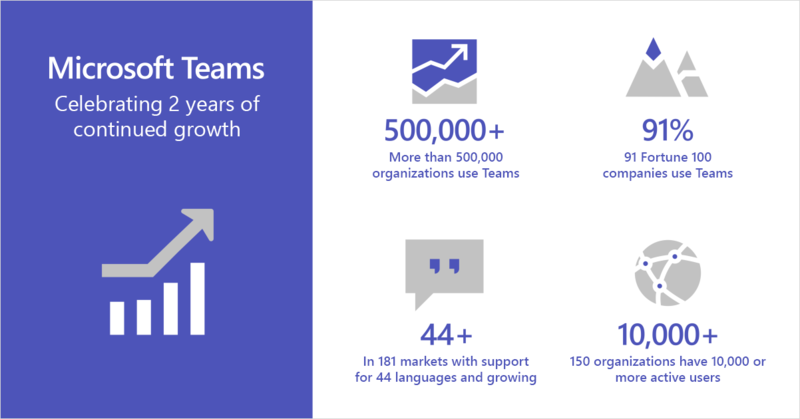 This week marks the second anniversary of the worldwide launch of Microsoft Teams. Over the past two years, Teams has grown significantly in both new capabilities and customer usage, as the hub for teamwork that brings people together and fosters a culture of engagement and inclusion. We’re unveiling eight new capabilities in Teams that make collaboration more inclusive, effective, and secure. Watch Microsoft’s keynote at Enterprise Connect live Tuesday March 19, 2019 at 10 AM ET or on-demand. More than 500,000 organizations, including 91 of the Fortune 100, use Teams to collaborate across locations, time zones, and languages, including Cerner, Cox Automotive, dm-drogerie markt, Dr. Reddy’s Laboratories, Hendrick Motorsports, Konica Minolta, Lexmark, Mitsui & Co., National Bank of Canada, Pfizer, Razer, Ricoh, and Trek Bicycle. Teams is currently available in 44 languages across 181 markets, and soon we’ll roll out support for nine additional languages, including Hindi, Filipino, Bengali, Telugu, Tamil, Marathi, Gujarati, Kannada, and Malayalam. Microsoft Teams is improving workplace collaboration by helping organizations move from an array of disparate apps to a single, secure hub that brings together what teams need, including chat, meetings, and calling, all with native integration to the Office 365 apps. Users can customize and extend their experience with third-party apps, processes, and devices, giving them the tools they need to get work done. Following the customizable mobile Teams experience announced in January, today we’re unveiling eight new capabilities in Teams that make meetings more inclusive and effective while delivering new levels of security and compliance. Customized backgrounds takes our intelligent background blur technology further, allowing participants to select a custom background, such as a company logo or an office environment when working from home, to appear behind them during a meeting or video call. This improves the effectiveness of remote meetings by encouraging the use of video while minimizing distractions. Coming later this year. Content cameras and Intelligent Capture in Microsoft Teams Rooms will soon support an additional camera for capturing content, such as information on analog whiteboards. Using any USB camera, Microsoft Teams Rooms leverages Microsoft’s new Intelligent Capture processing to capture, focus, resize, and enhance whiteboard images and text, so remote attendees can clearly see whiteboard brainstorming in real-time, even when someone is standing in front of the whiteboard. Coming later this year. Microsoft Whiteboard in Teams meetings provides an infinite digital canvas for meeting participants to work together directly in Teams. With upcoming support for Whiteboard in Microsoft Teams Rooms, in-person attendees can also contribute. You can even add content from a physical whiteboard onto the Whiteboard canvas without having to recreate it from scratch. Whether you choose to participate from the meeting room or remotely, Whiteboard in Teams enables everyone to actively participate in the conversation. Now in public preview. Live captions & subtitles make your Teams meetings more inclusive for attendees who are deaf or hard of hearing, have different levels of language proficiency, or are connecting from a loud location. Improve meeting effectiveness by allowing attendees to read speaker captions in real-time, so they can more easily stay in sync and contribute to the discussion. English preview coming soon. Secure private channels allow you to customize which members of the team can see conversations and files associated with a channel. You can restrict channel participation and exposure when needed without having to create separate teams to limit visibility. This is one of our top requested features and we’re excited to be actively testing this internally and with select customers. Coming later this year. Information barriers avoid conflicts of interest within your organization by limiting which individuals can communicate and collaborate with each other in Microsoft Teams. This helps limit the disclosure of information by controlling communication between the holders of information and colleagues representing different interests, for example, in Firstline Worker scenarios. This is particularly helpful for organizations that need to adhere to Ethical Wall requirements and other related industry standards and regulations. Coming soon. Data Loss Prevention (DLP) in chats and conversations enables customers to detect, automatically protect, and screen for sensitive information in chats and channel conversations. By creating DLP policies, admins can help prevent sensitive information from unintentionally being shared or leaked—either inside or outside of the organization. Now generally available in all Office 365 and Microsoft 365 plans that include Office 365 Advanced Compliance. 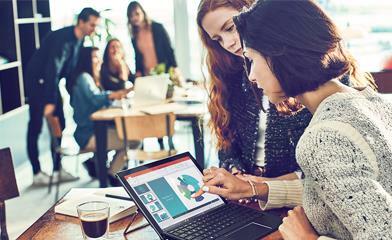 Live events in Microsoft 365 enables anyone to create live and on-demand events that deliver compelling communications to employees, customers, and partners. Live events use video and interactive discussions across Teams, Stream, or Yammer and can be as simple or as sophisticated as needed. Up to 10,000 attendees can participate in real-time from anywhere, across their devices, or catch up later with powerful artificial intelligence (AI) features—such as automatic transcription—to unlock the content of the event recording. Now generally available. To learn more about these announcements and more, read our detailed blog on the Teams Tech Community. All around the world, in businesses of every size and industry, people are using Teams as their hub for teamwork. With the help of Teams, airline crews stay connected, marketing agencies prepare pitches, teachers give all students a voice, financial analysts beat deadlines, patients receive better care, and employers find the right talent. We are thankful to all our customers, partners, and those of you who have become avid Teams users for coming on this journey with us. Legendary race team Hendrick Motorsports chose Teams as the hub for its race communications and decision-making. While the cars speed along the racetrack, race engineers, mechanical experts, and strategists take their positions in the Team Operations Center in Concord, North Carolina—hundreds of miles away. They gather and analyze massive amounts of data and communicate in real-time with the team at the track. “Quick, clear, effective communication is of the utmost importance in racing,” says race engineer Zac Brown. Zac relies on Teams to stay in constant contact with his driver, his crew chief, and pit crew at the track. He uses Teams to share large files and says that because Teams is integrated with the full Office 365 suite, it saves critical seconds otherwise lost in toggling between apps. Read more about how Hendrick Motorsports uses Teams for real-time race communications. Razer dominates the fast-moving gaming lifestyle industry where speed of execution and quality keeps them ahead. Managing dual headquarters in San Francisco and Singapore and an international team spread across the globe, Razer requires the best tools for rapid communication, fast decision-making, and real-time collaboration. They chose Teams to meet this need and gain a competitive advantage in this highly competitive industry. “We use Teams for the rapid-fire burst of communications we need to be super productive, and we’ve really changed the workplace culture, accelerating efficient communications to speed time-to-market—from innovation to manufacturing to marketing,” says Patricia Liu, chief of staff at Razer. Read more about how Razer users Teams to accelerate collaborative product development. Read more about how Cerner is consolidating communications in one modern experience with Teams. Konica Minolta is renowned for pioneering flexible work arrangements. It empowers employees to telework and do their best creative work from anywhere. Konica Minolta decided to embrace a new form of communication centered on chat, to make communication easier and speedier. With Teams, information workers have all their day-to-day tools in one place. Go Kawakami, IT infrastructure manager, says, “We manage tasks with Planner, report the status of projects with OneNote and Excel, and use SharePoint calendars as bulletin boards. With Teams, we can do this seamlessly.” The ability to invite people outside the company to a Teams channel has streamlined cooperation with partner companies. The company has seen many tangible efficiency improvements, from the PR division to the IT Help Desk. Read more about how Konica Minolta is enabling remote working from anywhere with Teams. These are just a few examples of how Teams is delivering an intelligent workplace for everyone—whether you’re a team at headquarters, a remote employee working from home, or a Firstline Worker serving customers each day. If you’re not using Teams yet, be sure to try it now. To see what’s next in our vision for Teams, watch Microsoft’s keynote at Enterprise Connect live Tuesday March 19, 2019 at 10 AM ET or on-demand.